Peel Road Station, or Poortown to some, was situated a couple of miles out from St.Johns on the former Manx Northern route of the Isle Of Man Railway. It was a “Halt” for much longer than it was a bona fide station, appearing and disappearing from the published timetables at infrequent intervals. Its reason for being was as an alternative to the passengers on the Northern line bound for Peel, but not wishing to undergo the trauma of changing trains at St. Johns. It was a short walk from the station to the outskirts of Peel. It also served to make the journey just a bit cheaper. Interestingly the station was served not only by the (IOM) standard gauge line, but also by a two foot gauge tramway from the Poortown Quarry. On the Ramsey side of the bridge there was a loading dock where the Quarry trucks could tip their contents into wagons for transport along the Islands rail network. Facilities were basic, the only wooden building on the North Line, comprising an Office, Waiting Room and Ladies Room. The gents facility was built alongside. Storage was provided by an old E Van body, still with its look out duckets, that was positioned immediately before the bridge, at the end of the low platform. Peel Road was one of only three North line stations boasting platforms, the other two being Sulby Glen and the terminus at Ramsey. On the occasions I passed Peel Road as a small passenger on a train, I was prompted by Grandfather or Father to look out quick to see it, for otherwise it would pass in a flash, if such a thing was possible on the IMR. It was only after the line closed that I got to take a closer look at the station, and by then it was in a sorry state, slowly rotting away and very unloved. Eventually it was put out of its misery and burnt down. To visit the site today it is still very atmospheric, the edges of the platform remain, and the road bridge of course. The quarry tramway has faded into the overgrowth, I can remember seeing the sleeper ends sticking out of the long grass on a visit twenty years ago, but some sustained excavation would be in order to enable them to be seen now. A model existed in the Railway Museum in Port Erin for some time. Operated by pressing a button to summon up either an IMR train formation or a Manx Northern one. The locos were very temperamental though, and on occasions it was thought highly amusing to run InterCity 125’s through the station at high speed. The model as removed during the revamp of the Museum in the late 1990’s. I built a version in 5.5mm scale for my loft layout in our first house, using the Museum model as a guide, sadly most of the buildings and stock from this layout did not survive a house move. Following a walk of the Ramsey route in the summer of 2011, I decided that my Foxdale & St. Marks line would take on more of a Manx Northern look, and after completing a model of one of the classic red sandstone station buildings and also the smaller stone built halt based on Lezayre, my attention turned to Peel Road as my next project. Roughly sketched up in microsoft paint, the front elevation sent out to various contacts to see if they agreed with my recollections of the building. All of the photographs I have seen are three quarters views taken from either left or right hand side, and shadows obscure some of the detail.The feedback I got was that this was more or less the correct of the front of the station. The ply shell was marked out with the positions for the windows and doors and then the shell was decorated with a skin of coffee stirrers, suitably cut to shape. After the stirrers had stuck, further planks were added to further detail the building. The doors were then glued on to the positions left for them. the gents toilet facility, such as it was, will be added to this end of the building. At the other end, a door is situated in the middle of the side wall, with a simple porch. This was possibly the ladies room. The roof awaits corrugated plastic sheeting and the window detailng needs to be taken care of. I already have the "E" van body store room built, but will need to add the look out duckets. At the other (St. Germains) end a small porch shelters the doorway to the Ladies facility. 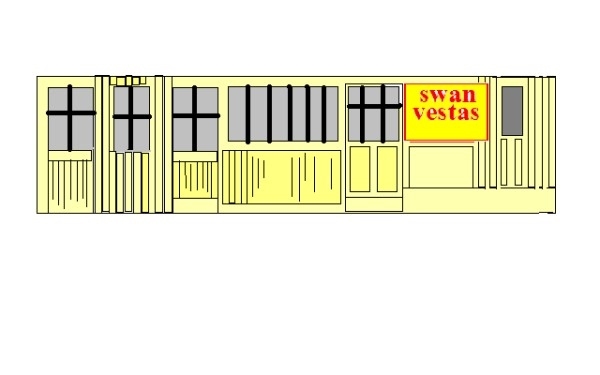 The ever present Swan Vestas advert decorates the front wall, in reality covering where a window once was. The notice informs any unlikely passengers that this is a request stop, and gives the procedure for stopping a passing train. Just about complete now, some alterations to the road bridge and final ballasting of the removable section.